Credit to households ($15.25 trillion or 79.7% of GDP): U.S. household debt includes $10.1 trillion of mortgage debt, $1.5 trillion of student debt, $1.1 trillion of auto loan debt, and $0.8 trillion of credit card debt. While still very high, the level of household debt relative to GDP has declined slightly over the past ten years due to the many mortgage-related defaults that have occurred since the financial crisis. 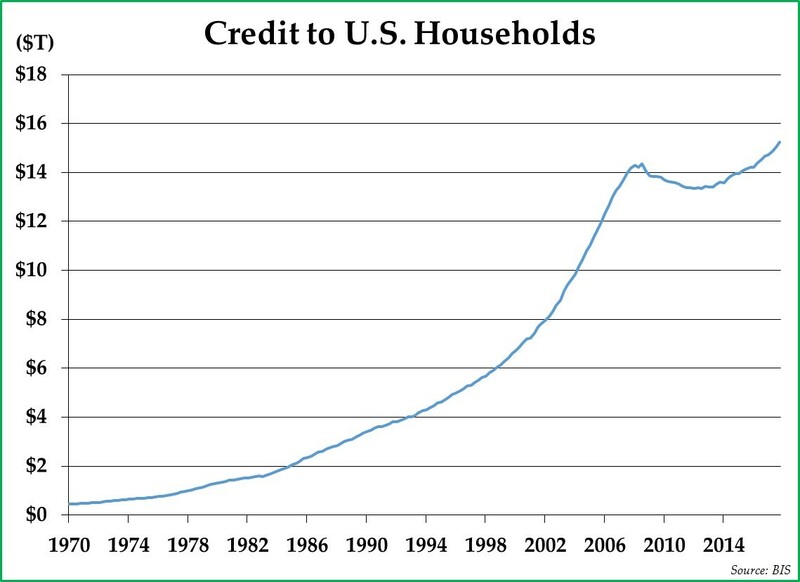 Nevertheless, household debt has increased dramatically at a rate of over 7.1% per annum over the past forty years as household income has simply not kept pace with increases in living expenses for most Americans, particularly with regards to healthcare, housing, and education expenses. 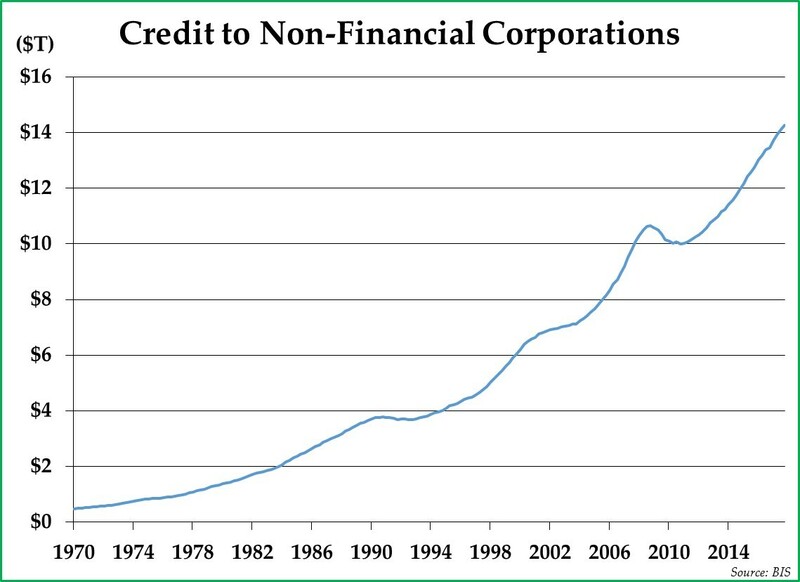 Credit to non-financial corporations ($14.26 trillion or 73.5% of GDP): Corporate debt stands at a record level and continues to grow, driven by corporate buybacks and the growth of leveraged buyouts. Record issuance of corporate bonds and leveraged loans in recent years has boosted the share prices of both public and private companies, driving outsized compensation increases for management teams and private equity firms through financial engineering. As interest rates increase and corporate bankruptcies accelerate, investors and employees will see the unfortunate downside of this level of leverage. 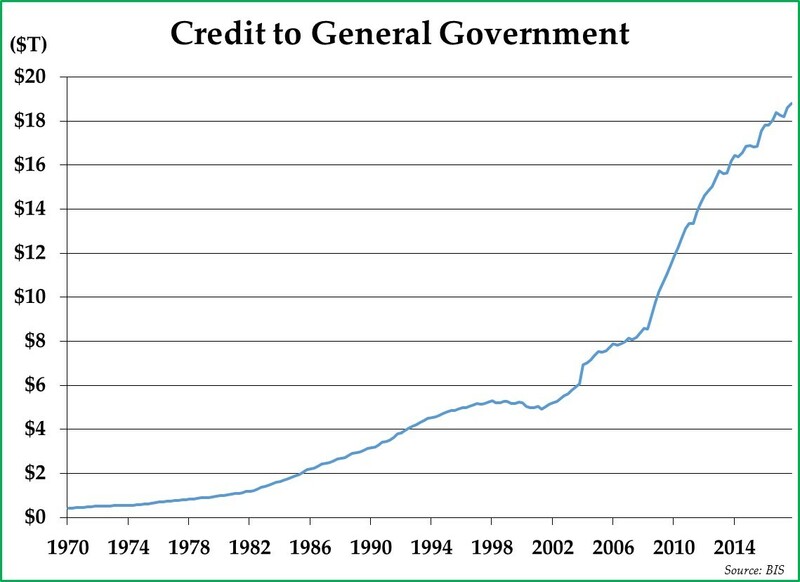 Government debt ($18.81 trillion or 97.0% of U.S. GDP): Government debt includes $3.1 trillion owed by various state and local governments along with $15.4 trillion owed to the public by the Federal government. These debts are also at record levels and continue to grow at a faster rate than GDP, driven by demographics, military spending, deficits generated during the Financial Crisis, and a persistent mismatch between tax revenues and spending levels. Unfortunately, Congress and the Trump administration further impaired the Federal government’s financial strength by passing the Tax Cuts and Jobs Act (TCJA) of 2017, which is projected to increase future U.S. government deficits by almost $1.5 trillion per annum over the next decade and by approximately $1.0 trillion per annum thereafter. Social insurance obligations ($49.0 trillion or 253% of GDP):Every day, roughly 10,000 baby boomers retire and begin collecting Social Security and Medicare benefits for the first time. As the retiree to worker ratio increases, demographic challenges will increasingly put cash flow pressure on the Federal budget. According to U.S. General Accountability Office (GAO) estimates, the net present value of the Federal government’s Social Security obligations is $15.4 trillion, or 79% of GDP, while the net present value of Medicare obligations is $33.5 trillion, or 173% of GDP. These costs are driven by both demographics and runaway healthcare price inflation. 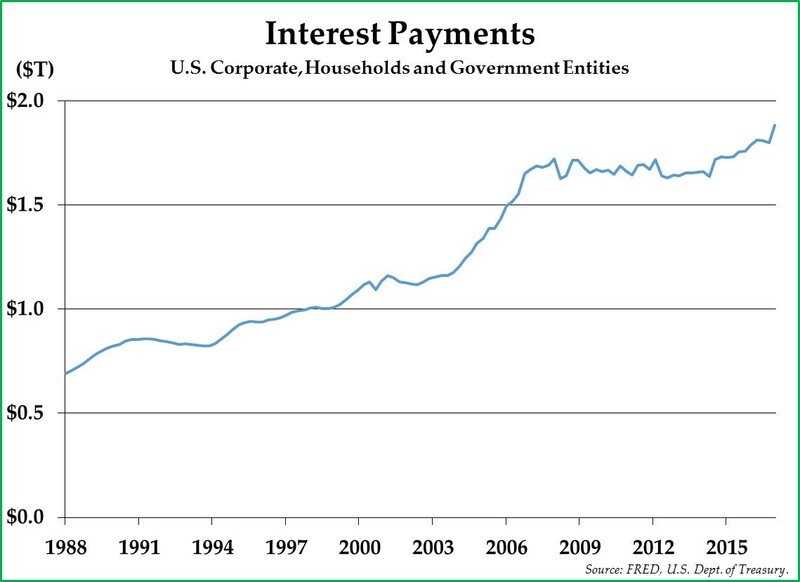 As debts have increased and as interest rates have begun increasing, interest payments for U.S. corporations, households, and government entities are now almost $2 trillion annually. Even without the Federal Reserve raising interest rates further from current levels, interest payments should exceed 10% of GDP in 2018. If interest rates were to rise to levels close to the historical average, interest rate payments would devastate the U.S. economy and likely result in another debt crisis. Thus far our discussion has centered on the U.S. economy, but the excessive financial obligations are widespread across the world. The Financial Crisis was, after all, a global crisis, affecting large multi-national banks across the world, and other countries’ challenges are similar to or even worse than that of the United States. For example, while the combined private and public debt/GDP ratio is 252% in the United States, countries like the United Kingdom, China, Japan, and Canada have debt/GDP ratios of 283%, 256%, 373%, and 289%, respectively. Put simply, many of the largest economies across the world are seemingly drowning in excessive financial obligations. These financial obligations are deflationary and make the global financial system more fragile. If the world were to enter a deep recession and global GDP were to decline by 5%, the debt ratios listed above would materially increase. As corporations, consumers, and perhaps even some governments defaulted on their debts, global GDP would likely decline further, creating a vicious cycle which economist John Maynard Keynes famously described as a liquidity trap, whereby everyone just wants to own cash. During the Great Depression, many banks failed because cash was no longer available for depositors to withdraw. Maintaining negative real interest rates: Keeping real (e., inflation-adjusted) interest rates persistently negative over several decades is the cornerstone of financial repression. While harmful to fixed income investors, negative real interest rates make it easier for GDP to grow faster than public debt, thereby reducing the debt/GDP ratio. Alternatively, a surprise burst of inflation accomplishes the same goal, but in a shorter timeframe. 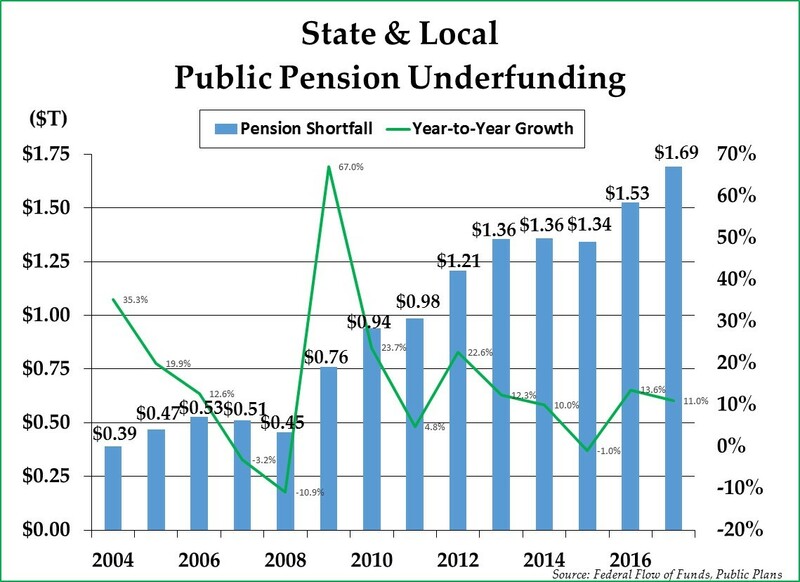 Herding domestic investors into public debt: Laws and regulations that force or coax investors into owning more public debt represent the other critical component of financial repression. For example, regulatory changes regarding money market funds have thus far resulted in a trillion dollars of additional domestic capital that own U.S. government debt since 2016. So far, these policies have not worked as successfully as they did after World War II; the debt/GDP ratio has only continued to increase since the Financial Crisis. Also, more recently, Congress and the Trump administration have enacted revenue cuts along with budget increases which should further increase the budget deficit and government debt. For those reasons, we believe the likelihood of a surprise burst of elevated inflation seems to be increasing. At the present moment, interest rates and inflation are rising, U.S. stocks are generally expensive, geopolitical risks are increasing and the economy, while seemingly firing on all cylinders, has been expanding for nearly a decade. Given this backdrop, we are investing carefully and probably erring on the side of prudence and defensiveness. We generally view our short-term bond portfolio as a portfolio of “cash equivalent” investments. Our expectation is that this capital can be deployed into attractive, undervalued, equity investments when the opportunity arises. While not generating a particularly attractive return per se, our short-term bond portfolio provides us with optionality during market downturns. If inflation grinds on for years at a rate slightly above the long-term interest rate or if an inflation surprise arrives, long-term bonds will not be a good way to generate positive real returns. Accordingly, we do not own any long-term bonds in Appleseed Fund. Facebook, Amazon, Netflix, and Google (the so-called “FANG” stocks) have promising businesses with quickly growing revenues and profits. These companies have no less promise than Cisco Systems had in 2000. However, a great business alone does not make a sound long-term investment, because the price we pay for any investment matters. Cisco Systems shares generated a negative return during the decade that followed its peak in 2000, and we suspect that the FANG stocks will have a similarly difficult decade between 2018 and 2028. We do not own any FANG stocks in Appleseed Fund. Commodities and companies whose earnings increase with commodity prices tend to do well in an environment of rising inflation. The agricultural sector in particular appears attractive right now, as agricultural commodity prices have been depressed due to bumper crops in recent years. In Appleseed Fund, we own Titan International (TWI), a producer of tractor wheels and tires, and Mosaic Company, a fertilizer producer. We also own other companies whose earnings should benefit from an increase in commodity prices, including Stagecoach (SGC-London), Sberbank (SBER-London), and Bollore (BOL-Paris). Just as bargains could be found at the peak of the Dot-Com bubble, we are finding bargains today. We are seeking to avoid exposure to the most wildly overvalued sectors of the stock market while investing in out-of-favor companies which are ignored or temporarily out-of-favor. If inflation accelerates, equity valuation ratios (such as the P/E ratio) should compress, but more so for those companies that trade at an expensive P/E ratio than for those companies that already trade at a discounted P/E ratio. We own a number of companies, including BMW (BMW-Germany), Sberbank, SK Telecom (SKM), Stagecoach, Air Lease Corporation (AL), and Samsung Electronics (057050-Korea) which have a P/E ratio of less than 10x. Equities outside the United States are generally more attractively valued than U.S. stocks, and emerging market stocks, while somewhat more volatile, look particularly attractive as long-term investments. If a U.S.-centric inflation surprise happens, companies with profits denominated in foreign currencies should perform better than U.S. companies. At the end of the quarter, 29.1% of Appleseed’s equity exposure are U.S.-based companies, 12.7% are based in developed market countries outside the United States, and 22.0% are based in emerging market countries. Historically, gold has generated better returns than bonds in negative real interest rate environments. As the dollar’s role as the world’s reserve currency weakens, we believe that it is likely that gold will become an important reserve asset once again. Finally, if an unexpected large burst of inflation arrives, gold should serve as a useful inflation hedge and store of value. At the end of the quarter, 16.8% of the Fund’s net assets were invested in gold bullion trusts. In summary, we are wary of rising interest rates and compressing P/E ratios which often accompany inflation. We believe we are positioned for an environment where inflation accelerates, but we are also trying to hold enough capital in the form of cash and short-term bonds so that we can take advantage of investment opportunities as they arise.